Real And Fake Christmas Tree Sellers Fight For American Hearts And Minds Online ads are telling Christmas shoppers to "keep it real" or "think about seasonal allergies" when they make their tree choices this year. Casey Grogan walks through some recently cut noble fir Christmas trees at his farm near Silverton, Ore. This year he plans to harvest 60,000 trees off his property. This Christmas shopping season, a marketing war for families' hearts is escalating between the real and artificial tree industries. The companies behind each type of tree are going at it with ad campaigns online, trying to convince you theirs is better. In one social media video, upbeat tinkly music and fresh-faced tree farmers chirp: "That smell, that wonderful fresh Christmas tree smell. That beautiful scent that fills the house. Smells like Christmas! That can't be manufactured." The Christmas tree farm industry will spend more than $1 million this year asking you to "Keep It Real." It's like the "Got Milk" campaign: These online videos are developed and paid for by tree growers under a program overseen by the USDA. One of those growers is Casey Grogan. His crews are working to cut and ship about 60,000 Christmas trees in just 10 days from his Silver Bells Tree Farm about an hour south of Portland, Oregon. It takes at least eight to 10 years to grow and sculpt a fresh tree for sale, Grogan says. And artificial trees are looking more like his fresh ones every year. "They are kind of stealing our concept and our art," Grogan says. 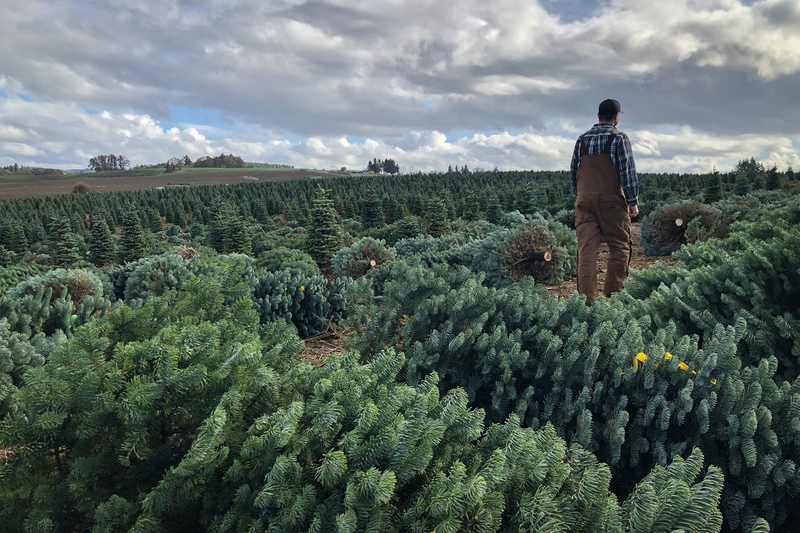 Grogan's is one of several commercial Christmas tree farms in the foothills of Oregon's Cascade mountains. He's lived here his whole life. But even some of his lifelong friends in town have started to buy fake trees. "I just kind of scoff at it and ask 'em, 'What are you doing?'" Grogan says. "'Come on you know. You're an outdoors person; how come you have an artificial tree?'" They usually tell him it's just easier. And the artificial tree industry is telling everybody that, too. "They can look remarkably real"
In a video on the American Christmas Tree Association Facebook page, a man standing in front of a artificial tree in a brightly-lit store says: "Real or artificial, there is no bad choice when it comes to picking out the perfect Christmas tree for your family this season. Think about things like price point and seasonal allergies when picking out your tree this year." 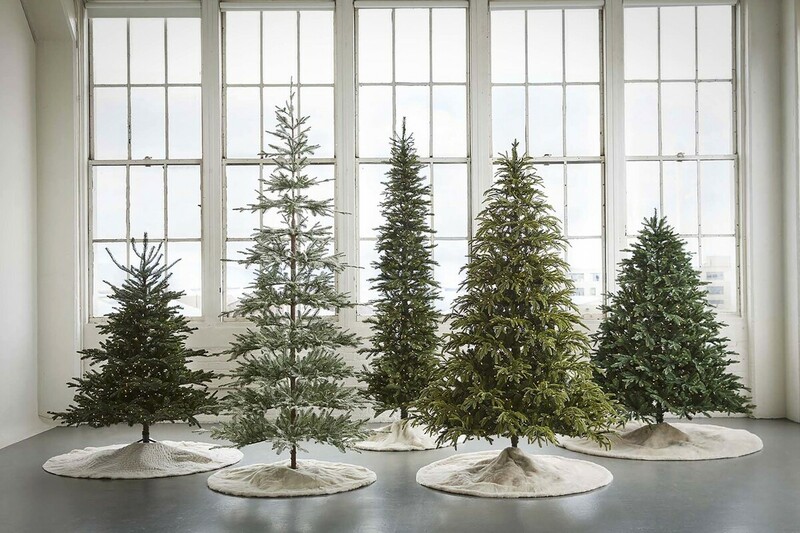 The American Christmas Tree Association, which represents manufacturers and retailers of real and artificial trees, is trying to highlight popular trends with artificial trees, and claims the trees look more realistic every year. The American Christmas Tree Association is based in Los Angeles and run by Jami Warner. She says her association represents manufacturers and retailers of real and artificial trees. "We're very agnostic when it comes to Christmas trees," Warner says. "We do believe that it's a personal choice. We're very concerned with fire safety, we're concerned with ease of use, reusability." She insists all Christmas trees are good Christmas trees. When it comes to artificial ones, she's up on all the trends. "There's new technology on artificial trees," she says. "They're better than ever. LED lights last longer and don't break. The trees can come pre-fluffed. There are flip trees and snap trees that assemble in seconds. And they can look remarkably real." Her organization says people snapped up more than 21 million plastic trees in the U.S. last year. Her association's operating budget is under $200,000. But some big artificial tree companies are doing their own marketing. For example, this season the artificial tree company Balsam Hill is sponsoring the Hallmark channel, and the holiday tour of the singer-songwriter Jewel. So tree growers continue to answer back with their own online videos. One asks: "Years from now, which do you think you'll remember the best? Assembling an artificial tree you've pulled from the attic? Or going out as a family to select the right tree for you?" Behind that video is Marsha Gray, the executive director of the Christmas Tree Promotion Board and the "Keep It Real" campaign. Gray is on the online hunt for young, decision-making women consumers. "Millennial mom is our top sweet spot," she says. "She's getting her information, doing her shopping online—and that's where we hope to reach her." Fresh Christmas tree growers want to be a part of families' firsts, Gray explains. "First marriage, first kids, first home—those are key moments for our industry," she says. So they're spending most of their farmer-funded budget on social media ads. This year's video campaign aims squarely at millennials and others who may have never had fresh trees in their childhood homes. The video shows families picking out real trees so those who haven't done it can visualize the experience, Gray explains. This spring, tree growers will have the choice to keep the campaign going by taxing themselves 15 cents per sold tree if they sell more than 500 a year. But it may be a decade before farmers know if the campaign worked, Gray says. By then Casey Grogan's noble fir seedlings will be mature—so this year he's still guessing how many to plant.